The last episode of King of Dramas (KOD) was not exactly drama mastery but was far from disappointing. I am okay with the conclusion- the show ended well and did not slaughter the characters with contrived episode extension ideas. Henceforth is a recap of the last episode of KOD. Grab your orange juice; after all it is worth 300 million won. The first scene in our last episode picks up where we left off, with Anthony and Go Eun’s long awaited kiss. Go Eun’s declaration that it does not matter to her if Anthony goes blind seems to make the cold King go all warm and fuzzy inside. After an apparently impromptu decision based on a sudden cut to this scene, the lovebirds take a trip to watch a seaside sunrise (potentially Anthony’s last). Go Eun is caught in an awkward situation when Anthony proclaims they should sleep before they return to Seoul. Assuming he means sleep she stutters her innocence only to have Anthony call her a pervert. He meant sleep in the car before they left after all. Haha. We cut next to Go Eun, who is a terrible driver, piloting Anthony’s car back to Seoul. After some cute staring-at-each-other moments in the car we jump to Anthony and the World Production team in a ra-ra we will win in the end meeting. Declaring that he will work on the scripts with Go Eun the rest of the World Production crew goes about their business ensuring the last few episodes will dominate the ratings. We find ourselves back on set with the director, who is instructing the floor director that starting at that point all of Min Ah’s scenes have to be filmed together (due to her super busy schedule shooting a drama and a movie in tandem). At the same time we find Hyun Min and his newbie manager counting the total scenes that he has over Min Ah. 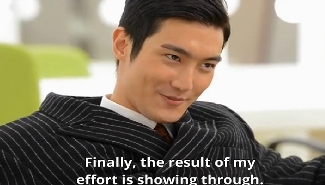 Convinced that his increased scene count is because of his improved acting skills Hyun Min gloats. Little does our idol actor know Anthony instructed Go Eun to cut Min Ah’s scenes due to her busy schedule and not because of his mad skills. Haha. Next we find Go Eun and Anthony reviewing the next script in her apartment. Go Eun notes that all of Min Ah’s scenes can now be shot at once to accommodate the actresses busy schedule. Now Hyun Min really looks like a doofus. We have some more longing stares and then Anthony asks the question he posed to Go Eun on the day he realized he was going blind, “When did you first start liking me?” She gives him the truth this time- it was when he proclaimed his trust for her during her plagiarism accusation. Go Eun, not ready to have been so honest without something in return demands to know the same of Anthony. Cleverly Anthony tells her once she finishes the scripts he will tell her. Aishh! That man really always answers one way and one way only “Well after your work is done”. Hyun Min, with his scene stealing prowess is busy shooting with Min Ah. Unfortunately due to his increased air time he is having trouble remembering his lines. After several NGs the director calls a break. Min Ah takes the opportunity to suggest a cheat sheet, an idea that Hyun Min flat out rejects- he is now an actor after all! After resuming filming, still having trouble, Hyun Min suddenly notices something written on the wall near where the script has him place his hand (directly above Min Ah’s head and not facing the camera). They are his lines, written there by Min Ah to help him. Awwww! So they do like each other. 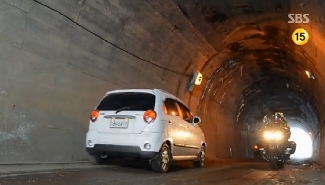 After a cute exchange the scene is filmed correctly. Meanwhile we find Anthony back at the hospital where he gets a glimmer of hope in his fight against blindness. A clinic in Florida is performing trials for a medicine to cure his condition and so far they have had success. Anthony’s doctor does not promise anything but says he will try to get Anthony into the next trial for this medication. Back at the writing room Go Eun’s mother drops by (with food. Always with food). Hilarity ensues as her mother finds two toothbrushes and men’s skincare products in her Go Eun’s apartment. Convinced it must be that Bong Dal fellow, Mom goes on a full out rant as Anthony walks in the door. Awkward knowing glances occur between Ms. Writer and Mr. President and Mom is left grabbing at her daughters phone and dialing up the number that is stored as “Bong Dal”. Of course Anthony, who is standing two feet from Mom, smiles as his phone begins to ring. “It’s my phone’s alarm” He lies. Haha. Mom gives Go Eun a warning and leaves, buying the alarm story. We find Hyun Min and Min Ah on set, sharing coffee during their break. Hyun Min was very taken by Min Ah’s gesture that helped him remember his lines. 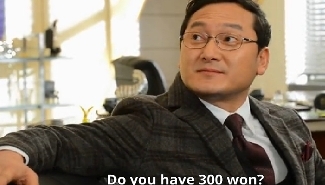 With Hyun Min logic he promptly tells Min Ah she clearly has fallen for him. As usual Min Ah shirks his affections and storms off leaving Hyun Min to watch after her, marveling at how cute and adorable she is. Min Ah, back in her dressing room, receives a call from the Taesan Group. They have a new writer for her next drama. Confused, as Anthony had said Go Eun would write their first drama for Taesan, Min Ah questions this. She is told that Anthony backed out of the offer by Taesan for personal reasons. 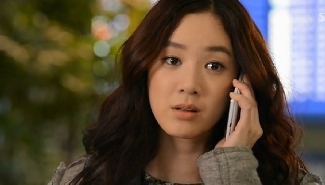 Shocked at the unexpected news, Min Ah calls Anthony up. Once again with the once-you-finish-your-work excuse he tells her he will explain his rejection of the Taeson offer after the last episode of Kyungsung Morning is complete. Min ah is puzzled but has little time to dwell on it. After the last ratings (a whooping 26.8%) are announced the entire cast and crew celebrate on set with a cake. As ratings continue to improve with each episode (too bad KOD did not have the same success) we find everyone hard at work. Anthony is busy in the writing room with Go Eun and as she finishes the last script with a huge smile and a cute “the end” he tells her to get dressed, they are going out. We cut next to Anthony’s Mother’s nursing home. Oh don’t tell me. Is he? Awwww. He introduces Go Eun to his Mother, keeping the promise to bring the woman he loves to meet dear old I-told-everyone-else-you-were-dead-Mom. How sweet. While visiting Mom Anthony receives a call to go to the hospital right away, his doctor has news for him. Anthony and Go Eun arrive at the hospital and find out that Anthony has been approved to be part of the next round of trials for the drug that may potentially cure his condition. However he has to leave the next day to go to Florida for the treatment. Back at the office Go Eun gives Anthony the same piece of advice he once gave her- you have to make miracles happen. Therefore he has to go, not worry about the last episode, and make his miracle happen. As they agree on that and the fact that Go Eun will let the others know why Anthony is absent we cut to our next scene- the rooftop. As they have done many times during the series Anthony appears on the roof of the office and Go Eun on the balcony of her apartment. Go Eun, seeing Anthony first, calls him and they have an adorable phone exchange. I just love how their relationship, while not perfect and candy coated, works well with their personalities. Next we are faced with some weird good bye scenes. Anthony apologizes to his arch enemy, Mr now president of Empire Productions and our stalwart Drama Production coordinator in separate scenes which just seem, seem, so…this is it. Is flying to Florida that dangerous? I have done it three times and I never told my enemies I was sorry before I left. Oh well, maybe next time. Back to the set we get our first hint of trouble. Min Ah is stuck in traffic and will not make it to the set on time to film the last episode (which, of course, is set to air that night). Uh-oh. This is not going to be good. Anthony and Go Eun arrive at the airport and they have a poignant goodbye. 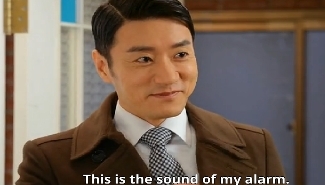 Anthony leaves but as he walks towards his gate he receives a call from PD Joo. PD Joo relays the fact that the drama is in trouble because of Min Ah’s absence. This news has Anthony stopping in his tracks. What does he do? Is the drama more important than his health? Staring down at his passport it is obvious he is torn. Our questions are immediately answered as he appears in front of Go Eun, having abandoned taking the flight because of the drama. Go Eun is angry but is calmed when Anthony explains that he has already booked the next flight- no worries as he will be leaving at 11:45 that night. With Anthony staying for the sake of the drama the King is back in action. 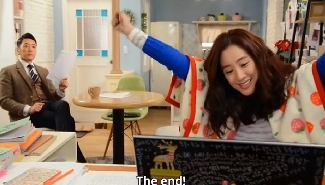 First he instructs Go Eun to rewrite a part of the script so Min Ah is only in two of the last scenes instead of five. He calls Min Ah and instructs her to find a motorcycle (did you forget what happened in the first episode!) to the set and then he sets off on his own to go to the filming location. Min Ah complies, taking a scary motorcycle ride to get there on time. Go Eun manages to rewrite the scenes in the airport office (allowed to use a computer thanks to fans of her drama, love this part) and PD Joo instructs Hyun Min to shoot his part of the dialogue scenes in case Min Ah does not arrive. Anthony makes it on set and within a minute Min Ah, motorcycle ride and all arrives. The final scenes are shot and now we are down to one final task- deliver the tape (doesn’t this sound too familiar?). PD Joo sets off with Anthony in the backseat, who is holding onto the tape like it is gold. Go Eun calls Anthony to find out when he will be coming back to the airport. He tells her it is okay, even though she is peeved he is back to his drama comes first mentality, and that he will have plenty of time to deliver the tape and get to the airport for his flight. After Go Eun hangs up she realizes that there is a flight board behind her. Looking for the 11:45 flight to Florida she is confused that it is not listed on the board. She goes to the ticketing desk and finds out that there is no 11:45 flight. Anthony had lied. Pissed she calls him back only to have him exclaim that his last drama and her first drama, and that is more important than his sight. After all, it is his last one. They end the call and within a minute tragedy strikes. As they cross an intersection Anthony and PD Joo’s car is struck by another vehicle, hitting directly where Anthony is sitting. PD Joo stumbles from the car and approaches the passenger side. Anthony falls out of the vehicle, badly injured. 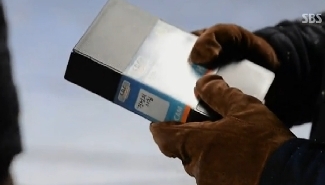 In a scene that I can’t help feel was played too dramatically Anthony hands the tape over to PD Joo and urges him to deliver it to the production office. It is for the drama after all. PD Joo takes the tape and leaves; an ambulance soon arrives to take Anthony to the hospital. Go Eun receives a call from PD Joo and learns of Anthony’s accident. She rushes to the hospital. 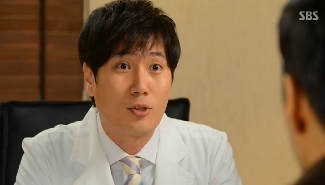 A bruised PD Joo makes it to SBC with the tape, telling everyone about the accident. They watch the ratings climb to their greatest marks yet, in silence with the knowledge that Anthony is injured. Go Eun arrives at the hospital to find that Anthony has flat lined. The doctor is using EKG to no effect. Can I mention it is just weird cutting from the ratings graph to a flat lined look at Anthony? Call me crazy but as the graph told us Kyungsung Morning hit its highest ratings the man who made it died, as evidenced by the graph that fell flat. Deep. Or ironic. Or a humorous use of images. Call it what you will. Go Eun, not ready to believe Anthony is dead, grasps his hands and says he could never die that easily. Apparently her words are true as his heart begins to beat again and our King of Dramas is returned to life. We jump forward a year to a shocking scene- Min Ah and Hyun Min all lovey dovey as they shoot a CF. What? Well, as the voice over explains, after quite the scandal they became a famous celebrity couple. So all of the hating turned out for the best! Awwww! More things have changed over the last year. We find that Director Nam is now the Director of Production for SBC and he has reconciled with his evil dad. Even better we find that our evil President of Empire Productions, the one and only two faced employee that ousted Anthony, has now been replaced by his own assistant. Ha. Love it. And to top it off we find him doing the same thing Anthony was forced to do, come around begging for money. Now that is karma. The fast forward we have all been waiting for involves our leads. So what are Anthony and Go Eun doing a year after their drama? We answer that question with an opening shot of Anthony lecturing on radio dramas. Huh? As we listen we learn that he believes the future is in radio dramas, a fact he is eagerly telling a small room full of employees of an unknown company. When one of his audience challenges him with a “Who could write a radio drama now a days”?” our star writer is introduced. Go Eun, who is the best writer in Korea. As the camera pans away we see that they are in fact in a broadcasting office, having re-launched themselves in radio. Thematically this was a story about Anthony and his growth as a person. From the top to the bottom back to the top and even further to the bottom we found his character and his growth as a human being driving 95% of the theme, consciously and unconsciously. The majority of what happened in KOD was a part of his character growth, or as I like to refer to it as Anthony’s ten step program to feeling human emotion. I liked this character, I really did. However I have a hard time saying that this character driven drama always hit the nail on the head, but I will admit it came darn close. Apart from the narrative and the theme I am a huge fan of the ensemble cast. 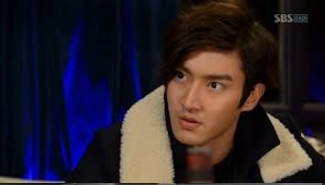 Choi Siwon was hilarious as Hyun Min, the narcissistic actor that never managed to fail in the humor department. I was also a big fan of Oh Ji Eun as Min Ah as long as she was doing anything other than chasing after Anthony- that is where her character fell flat. Jung Man Shik did a decent job as the foil and Kwon Hae Hyo (who I have always liked in his drama appearances) gave drama scheduling some heart. The idea of a meta drama can fail, as we have seen in past dramas within dramas. 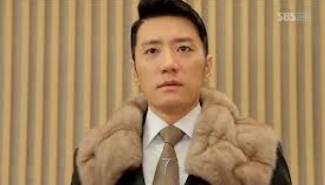 King of Dramas brought the right amount of sarcastically explained insider tips (orange juice anyone) to make this a fun and rewarding show to watch. I will miss the King of Dramas and I am sad to see that it is over. Long live the king!